Summary: As we approach the 3 year birthday for this recession it becomes desperately clear that our leaders understand neither what’s happening nor how to fix it. A host of quacks have come forth with facile analysis and often painful cures. The same situation often prevailed in 19th century, when immature medical theory allowed quacks to prosper by prescribing cures such as fasting, bleeding, and enemas. At the risk of joining the quack chorus, this post provides a simple perspective on the causes of our current problems, well-rooted in history and theory. That was then. What’s happening now? As background here is an excerpt from a April 2009 post Fetters of the mind blind us so that we cannot see a solution to this crisis. During the Great Depression policy makers were bound by what economist Barry Eichengreen called “golden fetters.” Fetters of the mind. 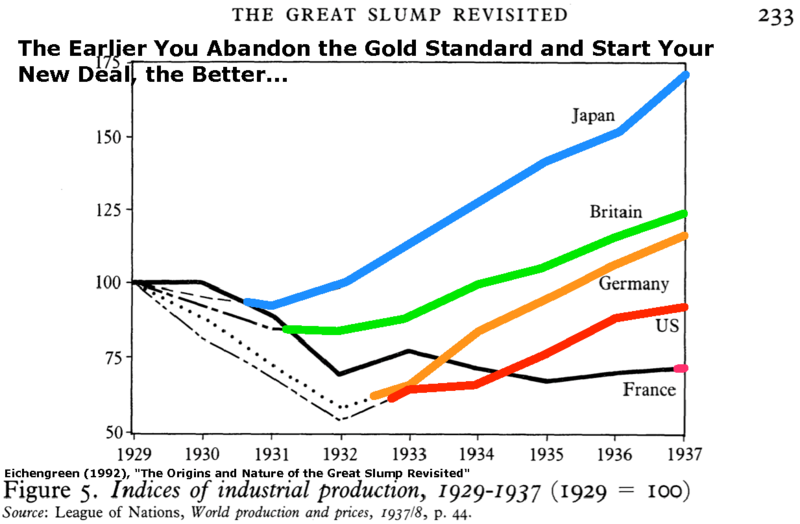 For reasons too complex to discuss here, nations could not take the necessary stimulus measures until they unplugged from the gold standard. That is, going off the gold standard was a necessary (but not sufficient) prerequisite for recovery. Under the force of events governments did so, but fearfully — not knowing what lay beyond this step into the unknown. In 1930 mainstream economists were confident they knew what to do. Now we know that most were wrong. If our situation was exactly like that of 1930, today’s economists would know exactly what to do. But that was then; this is now. The world has changed, but one thing remains the same: many economists are confident in their solutions. (2) That was then. What’s happening now? As Hugh notes, the IMF (and Wall Street) assumes a public policy of “kick the can down the road until it explodes” — structural current account deficits and surpluses among the world’s nations remain fixed in place until the systems burns (conveniently off-scale in the future). He also explains why even the 2011-2015 forecast looks too optimistic. His partner, Claus Vistesen (bio) runs a different analysis, but comes to the same conclusion. 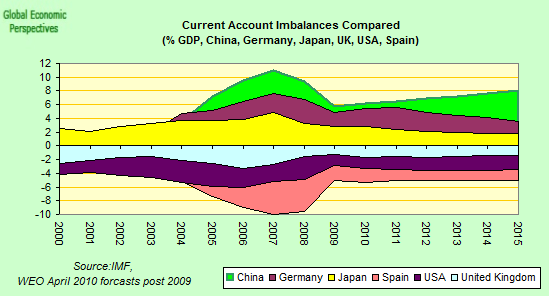 Their data and forecasts come from the IMF’s April 2010 World Economic Outlook (PDF). We have smart people, real experts. They have two hundreds years of accumulated economic theory, with computers processing massive accumulations of multi-national data. Why do they pretend that the current dynamics can continue? Why can they not devise another, more stable, system? The usual answer on the internet is mockery of knaves to their leaders, as if anyone off the street could see and implement some obvious answer. Leaving the fools aside, can we find a reliable solution? Yes, but only after accurate diagnosis of the underlying problems. Answers need not appear when we need them. The world’s experts failed in 1929-32 since there was no useful economic theory for their situation. Keynes wrote his General Theory of Employment, Interest and Money (Wikipedia) in 1936, and the power of its insights were only recognized years later — after WWII demonstrated the power of a massive fiscal stimulus to revive a stagnant economy. Back to us, today. Here’s a small snapshot of our situation, the first step to a diagnosis. During the past two centuries we have tried currency regimes fixed to gold, currencies fixed with respect to each other, managed floats, and free floats. All work well, sometimes. None work in all weather, for long times during changing circumstance. But we can imagine no other system. Worse, the current economic regime has a Siamese relationship to the geopolitical order, one based on the hegemony of the United States — which can no longer maintain its preeminent state. Nor can we see what will replace that hegemony, and providing order and peace to the world. This two-fold problem challenges our imagination. Should we devise a solution, implementing it will certainly tax our wisdom and strength — and humanity’s abiltity to work together. That’s enough for now. On another day we will sketch out possible solutions. But they become relevant only after we complete the problem recognition stage at which we’re now stuck. Power shifts from West to East: the end of the post-WWII regime in the news, 20 December 2007 — We are seeing another western industry ceding dominance to eastern competitors, one more step in a larger process. Understatement can be a form of courage – a comment about the US economy, 28 February 2008 — Our leaders have begun to speak to us about unpleasant truths. What might they be saying in a year or two?